First, be sure to select a jicama that is round and firm to touch. 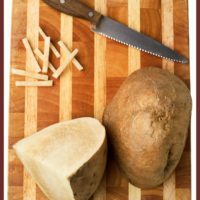 Always wash and peel a jicama (like you would a potato). Slice it up julienne style and add orange juice and fresh cilantro and mix together for a simple crunchy salad. Dice it up and add to a salad with sliced almonds and your favorite vinaigrette dressings. Cut into thicker slices and dip in hummus or guacamole for a light snack. Try a jicama slaw: easy to shred, and a great consistency, jicama is a great substitute to cabbage for cold slaws.